After stripping the cedar strip runabout I have, the original hull color looks to be a light blue. I was wondering if the Thompson Blue noted in the CD is a light blue? Or if someone is familiar with a light blue Thompson used, is there a match out there. This is late 40s early 50s. Not sure what "blue" is mentioned in the CD? Do you mean in some of the brochures? 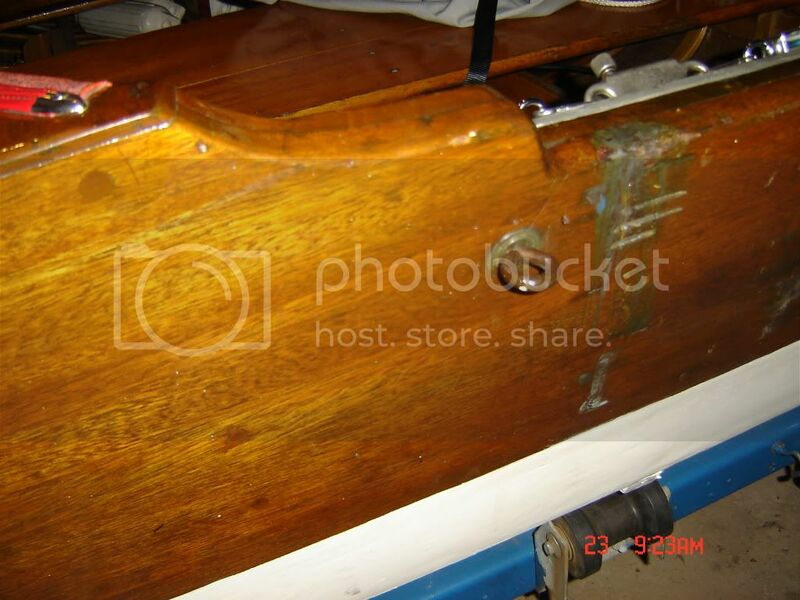 Not aware of any match to a light blue hull paint for a strip built boat. Check to see what is readily available from Interlux or whomever for a close match. My parent's 1958 Thompson of Peshtigo model 240 Take-Along was originally a light blue with red spray rail. They repainted her a different colour just a year or so after they got her. She was all sorts of different colours over the years. Today she is black below the spray ail and white above it. If you look at the "Sportboat" listed in the 55 brochure it describes the boat as light blue below the rails, white above with the Spray Rails being finished in an attractive shade of red. Sounds very similar to how this boat was painted. I think you can see what Thompson's "Light Blue" looked like if you go to the Main Page on this site and Click on "NEWS" in the main menu in the upper lefthnd side of the page right under Dockside Views. Then click on "Thompson Antique & Classic Boat Rally" mid page and watch the video of the first Thompson Rally. About 1:06 into the is a Thompson with the Red, White and Blue color skeem that is original. It is on screen for only a couple seconds. I know this boat and it is owned by one of the Thompson family members. At least that will give you an idea of what the color should look like. Thanks Phill. I will check it out. BTW, under the General section of the forum there is a topic called Transom. 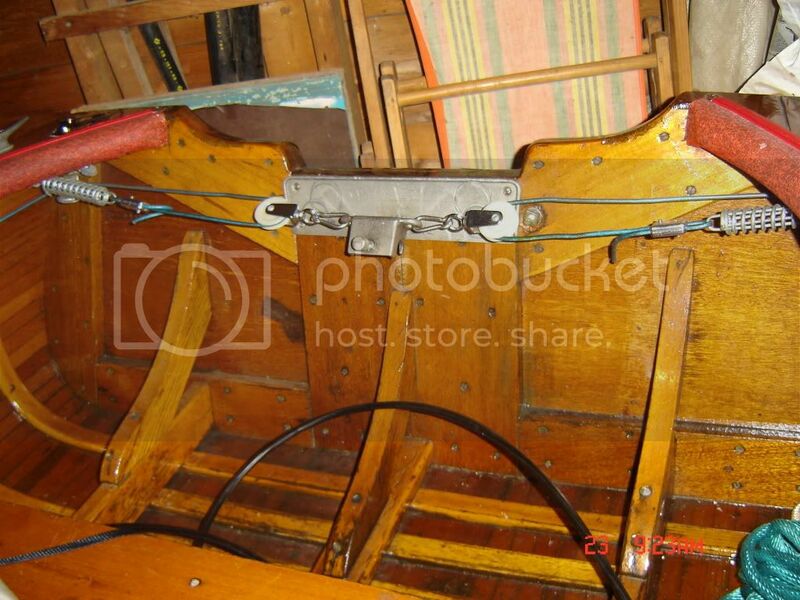 In it you guys talk about Thompson not using plywood for the transom. Mine has a plywood transom. My guess is that the plywood transom is not factory original to the boat. There is rot in the bottom corner of the transom it goes through the inside side cleat. My plan is to replace the transom and the cleat(s). Would I go back with a mahogany plywood or build it out of solid wood? I have not looked into finding the solid wood to do it, or how it is constructed. The transom on my Super Deluxe Runabout looks to be 3 pieces of 7/8" thick mahagany lumber on the outside backed up on the inside by 7/8" thick lumber which is screwed into the outer boards. See photo below. The three outer board apper to be approximately a little wider then 6" as my transom is 18-1/2" deep at the deepest and 15-1/4" in height at the motor mounting area. It is hard to determine the exact width of the board as the seams are so tight and the grain so straight that it is hard todetermine their widths. But this is what it look like to me. Also you asked me about the padding around my cockpits. 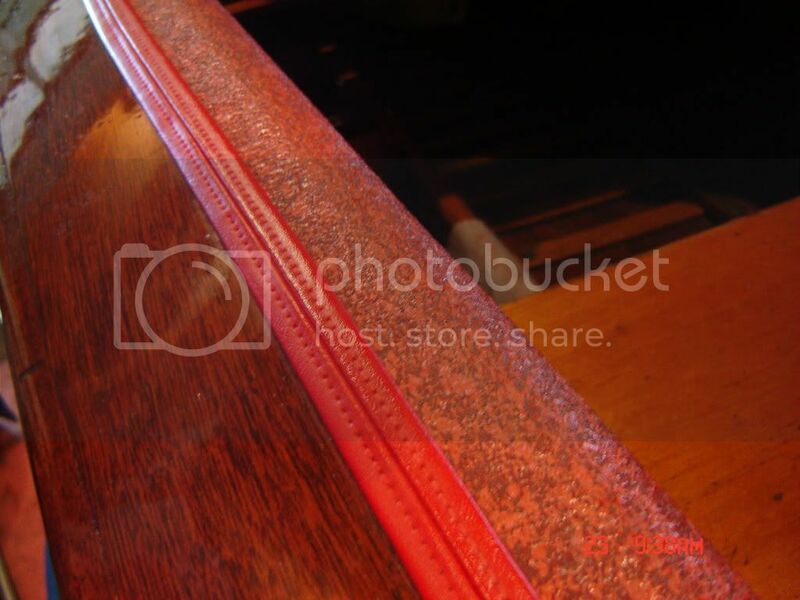 Here is photo of the vinyl and red welting to give you an idea of the colors. The vinyl is original and the welting is new. The padding is a molded very firm foam. Not sure if it is glued or nailed in place. Wow that is nothing like what I have. Thanks a lot. It gives me a idea of what I am going to have to do.